A fleet of novice monks, a few of them perhaps as young as 8 or 10, cross a side street in urban Yangon. In haste, one has spilled his shopping bag, and will have to collect his goods before traffic can pass. 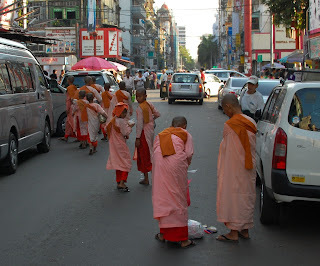 Buddhist monks were ever present for my visit to Myanmar, performing all manner of daily activities: catching the bus, smoking, cycling, shopping. And occasionally praying.